September 2018, Drozdowo near Orzysz in northern Poland. A lot of construction work in progress around and old school building. A volunteer is building barbed wire around it. It is a training centre, the only one of its kind in Poland, based on a military model, where leaders of the pro-defensive, paramilitary movements are going to be trained. 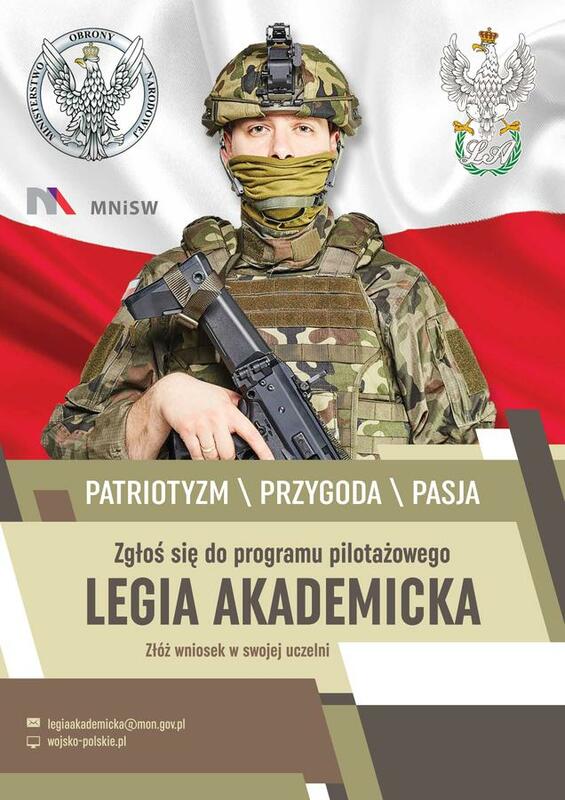 From September, in cooperation with the Ministry of Defence, students of military (or the so called uniform) classes – which are growing in numbers in Poland – will arrive there for trainings. The school’s fence is 4.5 metres tall and commands respect. Some people say that the former school has the most powerful gate in Poland – it can resist the impact of a speeding 40-ton truck. The fence and the gate help to build the atmosphere of this place, where 400 teenagers from the region will soon join training. The premises of the center are a gift from the mayor to the Combat Alert foundation, the organizer of the training centre. The foundation conquered his heart some years ago by organizing a peculiar drill – “raiding” the mayor’s office and releasing the “hostages”. There are at least 1340 uniformed, military classes in Poland. They were created to “strengthen the willingness to sacrifice and to voluntary restrictions in order to protect and defend the highest values – independence, sovereignty and security of the state, as well as freedom and civil rights”. Since the Law and Justice (PiS) won the elections and took power in 2015, decision-makers have deliberately appropriated the notion of patriotism. No one expected how simple it could be: it seems that it is enough to promote a model of attitudes, in which a young man in a green sweatshirt with national and military symbols is considered a “real patriot”. Thanks to this, the „Cursed Soldiers” (soldiers from the anti-communist underground of the 1940s and 1950s) and the soldiers of the Warsaw Uprising of 1944 became the heroes of Poland’s conventional consciousness – brave and ready to give their lives for the homeland. In order to maintain its readiness to defend Poland against „an enemy”, the Law and Justice not only has built the “real patriot” role-model, but also used refugee crisis and the vision of an imminent war in their narrative. According to sociologists, it is the preparation of fertile ground to educate citizens to blindly execute orders. How and why has patriotism surrendered to militarization in Poland? It is 2013. May, a sunny morning. Nearly 2000 students of uniformed classes from over 80 schools from all over Poland are standing at the Piłsudski Square in Warsaw. They are participating in a solemn roll-call by the Tomb of the Unknown Soldier. They vow “good learning and solid work”. A few years earlier, the Ministry of Defence abolished compulsory military conscription. Polish army became professional only. But the young people didn’t want stop wearing uniforms, they were willing to go for an adventure. The Ministry of Defence decided to use this energy and so has been supporting uniformed classes and pro-defence, paramilitary organizations. Until 2015 that support was marginal. Soon, however, a lot changed. It’s 2014 and Ukraine is burning. The “Little green men”, supported by the Russian army, start the occupation and then the annexation of Donbass and Crimea. Rockets fall on the cities and villages in the east of Ukraine, tanks demolish the roads, people die. Until then, those pictures were mainly known from reports from Iraq or Afghanistan. The war breaks out near the Polish border and people start to be afraid. On the wave of such moods, new social attitudes are born: the ethos of a soldier – defender of the homeland, partisan and insurgent – returns. The Law and Justice, a party that is about to take control over the country, senses this perfectly well. In autumn 2015 the coalition of the Civic Platform (PO) and the Polish People’s Party (PSL) loses power to the Law and Justice (PiS). Soon it turns out that the party is very good at diagnosing various social processes. In its rhetorics, PiS uses the rise of patriotic mood, but also the fear caused by the war in Ukraine and the refugees crisis. In coming years politicians of PiS will pronounce and interpret the word “patriotism” in all possible ways, but always associated with the defence of the country, with a gun in the hand. 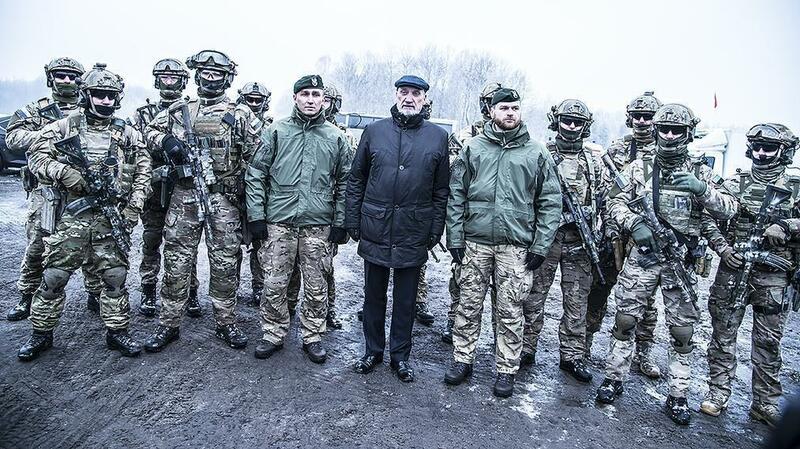 The then Minister of Defence Antoni Macierewicz with the Polish special forces during a meeting of the Territorial Defence Force (12. 2016); photo Robert Suchy (CO MON). Former members of special forces provide trainings to WOT. Antoni Macierewicz is appointed as PiS’ Minister of Defence. He’s an expressive politician with extreme right-wing views. He joins the ministry with ready-made projects. One of them is the establishment of the Territorial Defence Force (WOT). It is going to be a voluntary formation, commanded and trained by professional soldiers. The head of the Ministry of Defence quickly moves from words to decisions. After a few months, the new defence law is ready and adopted. On January 1, 2017, in addition to the land and air forces, navy and special forces, WOT becomes the fifth type of armed forces in Poland. However, this formation is only loosely connected to the military high command. Macierewicz places it under his authority and take special care of it. He announces that 53,000 volunteers will serve in WOT by 2019. – The territorial defence forces are a response to the common aspiration of Poles who, seeing the threats, have created paramilitary structures – says minister Macierewicz. To attract as many people as possible into the ranks of WOT, its command lowers the physical criteria for candidates and at the same time encourages them with money. Volunteers receive 500 PLN (ca. 115 euro) per month for the so-called readiness plus allowances for training. In Poland, the project is hailed as the “500 plus rifle program” (allusion to social benefit for families called “500 plus”). However, people from the army recall that when the Polish army became fully professional in 2009, a different voluntary service was already created – the National Reserve Forces (NSR). Soldiers have served there on similar terms as in WOT, the only difference being that they are assigned to line units and serve together with professional soldiers for a certain period of time. – NSR has been completely forgotten. Is service in NSR less patriotic than in WOT? What is happening now, is an appropriation of the notion of patriotism and an attempt to divide the army into the better ones – “the patriots from WOT”, and the rest – says general Bogusław Pacek, former chancellor of the National Defence Academy. WOT is not only considered to be “Macierewicz’s pupils” but also a useful tool for social impact and promotion of national ideas. The patrons of WOT brigades are the soldiers of the anti-communist underground, whose cult is inscribed in the canon of the new historical policy, promoted by the PiS government. It’s the cursed soldiers who are perceived as the protagonists of WOT, the progenitors and role models of patriotic attitude. Museums and monuments erected since 2015, to remember the underground and armed anti-communists, are difficult to count today. The government established March 1st as the National Day of Remembrance of the „cursed soldiers”. It is not only the army that has to worship and pay tribute to the new common heroes. Even fourth grade students read about the „cursed soldiers”. In some of the school books they can find out that the “real patriots” are the ones who, with a weapon in their hands, fight for his homeland to the end and are ready to sacrifice their lives for it. After 2015 Poland has faced an avalanche of new associations and foundations that focus on training children and young people how to use weapons. Fideles et Instructi Armis (FIA) Defence Association “prepares people to function in conditions of armed conflict, occupation, economic and social crisis. We teach how to take care of oneself, one’s family and one’s loved ones in extremely difficult conditions, as well as how to fulfill the patriotic duty towards one’s homeland, defending its independence and borders” – they advertise on the website. FIA’s official uniform is the camouflage of “Forest Panther” – the one used by the regular Polish Army. In 2016 Polish media describe a new idea of a director of a school in Milanówek near Warsaw: the teacher wants to create a class with a “national-mathematical” profile. He claims that it is a response to the needs of Milanówek residents, who are worried about the war in Ukraine and the migration crisis. Especially the latter, because there is a centre for refugees nearby. – I am not against refugees and willing to enroll their children at school, but when you know how to defend yourself, you immediately feel safer,” the teacher told journalists. After articles were published, he said he had been misunderstood. – The positivist vision of patriotism, the symbol of which was Eugeniusz Kwiatkowski – a Polish Prime Minister who built and developed the industry, simply disappeared from the list of readings at school. Positivists are being replaced by e.g. the cult of the Warsaw Uprising – says Joanna Kluzik – Rostkowska, former Minister of Education in the PO government. – In this way, Law and Justice creates a psychosis of fear in the society, and heads very hard towards the militarisation of patriotism. It even puts a sign of equality between patriotism and a military fight. It repeats the governmental narratives from 1920s and 1930s: generations must be brought up in such a way that they are ready to die for their homeland. Indeed, the Ministry of Defence drew the Ministry of Education into the idea of modern patriotism. Together they prepared several specific projects. One of them is a pilot program of certified uniform classes. Until recently, learning in such type of classes was based only on original syllabi, prepared by teachers. The Ministry of National Defence unified the program by and added to that elements of military training, which students are supposed to have at military units. The training last several weeks ends with a military oath and a transfer to the reserve. The father of the certified uniformed classes was Michał Dworczyk, the former Deputy Minister of Defence, today the head of the Prime Minister’s office. – We don’t want to shape mercenaries, but we want to shape future soldiers — he admitted. According to him, from September 2019 there should be one secondary school in each county, which runs certified uniform classes. The impact for change in the children’s training slowed down when Antoni Macierewicz stepped down from the office in early 2018 and Dworczyk found himself in the Prime Minister’s office. But there are still some of their projects in the Ministry of Defence, waiting for a better time. One of those is a project that would change the name of “education for safety” classes to “pro-defence education”. — Today, the topic is focused on first aid, and medical assistance during accidents. We want to strengthen the pro-defensive element. We want the last grades of secondary school to learn how to shoot – argued Dworczyk. The idea by Dworczyk is connected to another, equally controversial one: a plan to build shooting ranges in every administrative district of Poland. For the time being, the project remains on paper, as the government simply did not have the money for it. On the other hand, it seems that there is enough money for the governmental to, as Zbigniew Ciosek from the defence ministry said, “support historical activities aimed at shaping civic and patriotic attitudes, supporting patriotic ceremonies that refer to the traditions of national weapons (…) or supporting pro-defence organizations in the field of education and shaping pro-defensive attitudes”. Another project of the Ministry of Defence, launched in 2017, restores the voluntary training of students, called the “Academic Legion”. 54 ordinary universities and five military ones joined the program. The “Academic Legion” is supposed to refer to the tradition of an organization of the same name, established in 1918. Ministry of Defence advertises the project under the slogan “Patriotism, adventure, passion”. Students, however, are not very fond of polygons during summer holiday. The idea of militarisation of patriotism has not found an absorbent ground with them. “Patriotism Adventure Passion”. Poster inviting to join the Academic League. – Young people can easily detect the false notes in this narrative – the former minister of education says. – However, I am anxious about pupils of primary and secondary schools. The Law and Justice coined that putting on uniforms on children is patriotism, and its highest manifestation is to let oneself be killed. Running in the forest is to be more important than what is really needed in Poland. I think it is heading in a very dangerous direction – says Kluzik- Rostkowska. “I swear to always be faithful to my Homeland and the Young Army Brotherhood” – these are the words of an oath by the members of a patriotic youth movement called Junarmia (Young Army), which were received by the Russian Defence Minister Sergei Shyang. The paramilitary youth club is under the patronage of the Russian Ministry of Defence. The Young Army is to cooperate closely with military units, universities and sports clubs. Ideal youth should love Russia and Putin. In Poland, ideas haven’t gone too far yet. For now. The Ministry of Education does not answer the question whether it examines the fate of graduates of uniformed schools. It is not known what prompts them to choose such a profile or what kind of job they find after its completion. This article begins a series of stories supported by the IJ4EU grant. The IJ4EU fund is not responsible for the content and any use made out of it. Polish journalist, since 2016 working for onet.pl. Former journalist at Rzeczpospolita daily and editor-in-chief of Polska Zbrojna, war correspondent in Afghanistan. Based in Warsaw.